1997, 112 pages, paperback 8½" x 11", 120 color photos covers years 1983 to 1997, from the Classic Velvet Family Colledction to Lemonaide Stand. 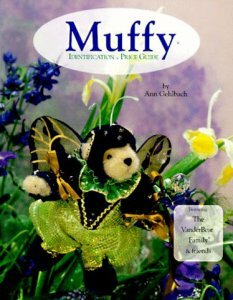 Provides the most information on Muffy, family and friends from their inception in 1983, organized chronologically by year of introduction with detailed descriptions of members, costumes, year of retirement and special features. Values are very outdated now but the color photos and descriptions can be very helpful when buying on the secondary market.